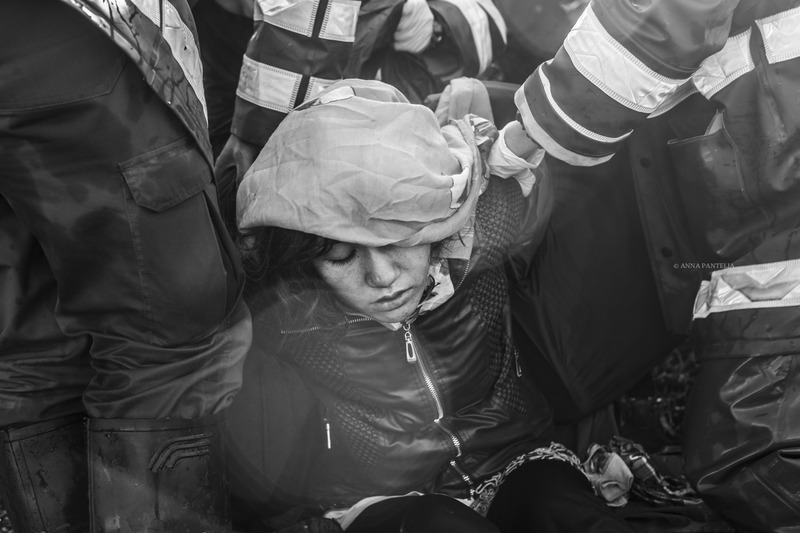 As the winter takes its toll on and high winds whip up the sea, men, women and the children are trying to cross the water-borders on their rubber dinghies that set off from Turkey to small Greek island of Lesvos, and hundreds of people rushing to help them to land safely. Among the trained life-guards and volunteers, you can easily spot locals of all ages trying to help as much as they can. 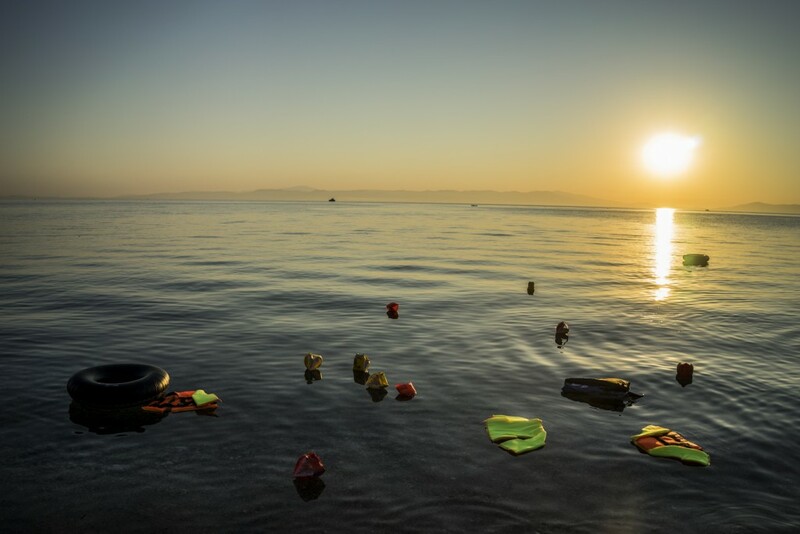 Lesvos has served as the main gateway for the recent refugee flows. But this is not the first time the small Greek Island has extended its hospitality to those fleeing danger. It also provided shelter to Greek refugees from Asia Minor almost a century ago. This history provides insights into how both in the past and now refugees coped with the challenges of survival, with material deprivation, with social and personal disruption and with the issue of looking for a place to make it home. Old photos from Lesbian families found in an antique shop in the city of Mytilene. The catastrophe of 1922 marked the end of the Greco-Turkish war and the start of the greatest exodus in the Greek history. It also ended the 3000-year Hellenic presence in Asia Minor. Following the Turkish military campaign, a great fire engulfed the city of Izmir and large number of Greeks lost their lives. Working and upper class Greeks who lived fairly comfortable lives in Asia Minor became the bottom rung in a post-war Greece struggling to take care of its own population. Hundreds of thousands had been fleeing since the first expulsion in 1914. Athens and the northeast Aegean Islands received the majority of the Greek refugees. Descendants of displaced Greeks from Asia Minor today comprise almost 60% of the population of Lesvos. Militsa Kamvisi and Konstanina Mesiskli are among them. The elderly Militsa lives on a pension of 330 euros per month in Skala Sikamias, the little sea-side village where the refugee boats arrive day and night. The photo of her feeding the baby of a refugee woman while she’s putting dry clothes on, travelled around the world through social media and started discussions about the nomination of Lesvos’ locals for the Nobel prize of peace. The famous of photo of Militsa feeding the baby of a refugee woman taken by Lefteris Partsalis. Militsa and many other locals, see helping refugees as a moral duty. Her mother left Ayvalik, Turkey and came to Lesvos at the age of 17 as an Asia Minor refugee without clothes, or anything else for that matter. All she had was her cousin, Kostantina’s mother. When they arrived on Lesvos almost a century ago, they were making tents out of stones and bed sheets; later they started working on the fields and staying overnight at olive presses until the refugee settlement commission built houses for the refugees. Constantina Mesiskli (left) and Militsa Kamvisi (right) in Militsa’s house in Skala Sikamias. Militsa followed the footstep of her mother. She was working in the fields harvesting olives, planting vegetables and taking care of kettles. With a country torn by war, Greeks were leaving the country to find a better life abroad. Militsa’s cousin, Konstantina, was one of them. Konstantina decided to move to the US where she was sewing wedding dresses. She spent 45 years in Ohio until this year when she decided to come back to her roots. Konstantina is able to communicate with some refugees who speak English. 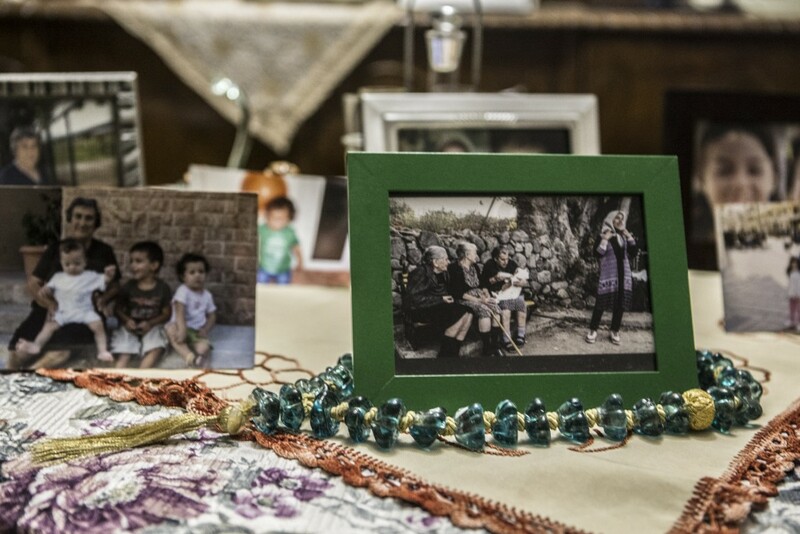 She always congratulates refugee-women for being brave enough to make this trip.“ I know how hard is to leave everything behind, my mother came here as a refugee and I went to the US as an immigrant myself, I spent 45 years there but my heart was always here in Lesvos,” she tells me in her soft voice. In Skala Sikamias a middle-aged working class man, Apostolos, and his wife, Paraskevi, wait for the dinghies to arrives. Once they land, Apostolos rushes into the sea to give them a hand. He is pulling out babies and young children off the boat. Apostolos is the grandson of an Asian Minor Greek. His grand uncle was recruited by the Ottoman army and his family never saw him again. 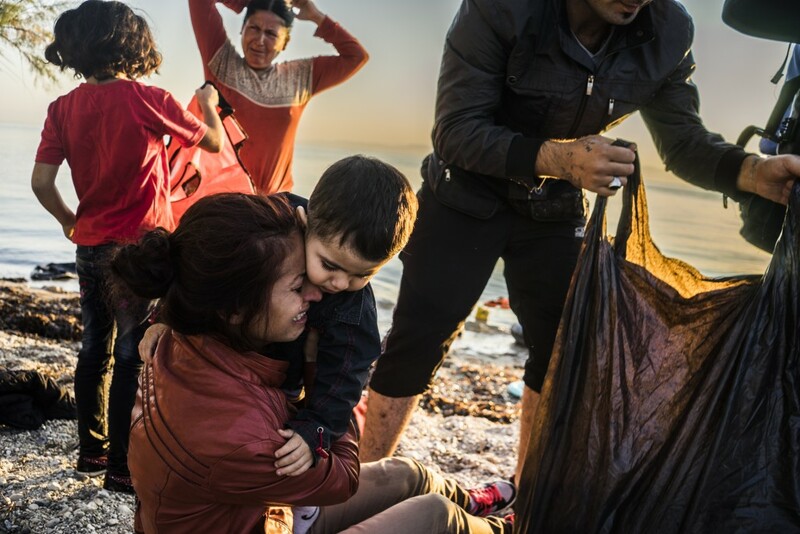 His grandfather was fortunate enough to make it alive to Lesvos. Mr Apostolos is 55 and has 3 sons and 3 grandchildren. The whole family lives on the island. He is from “Nees Kydonies” (New Ayvalık), a small village 23 km from the city of Mytilene. Almost every day he accompanies his wife and one of his sons to Skala Sikamnias to assist today’s refugees. “For me it is a duty to help these people” he says. 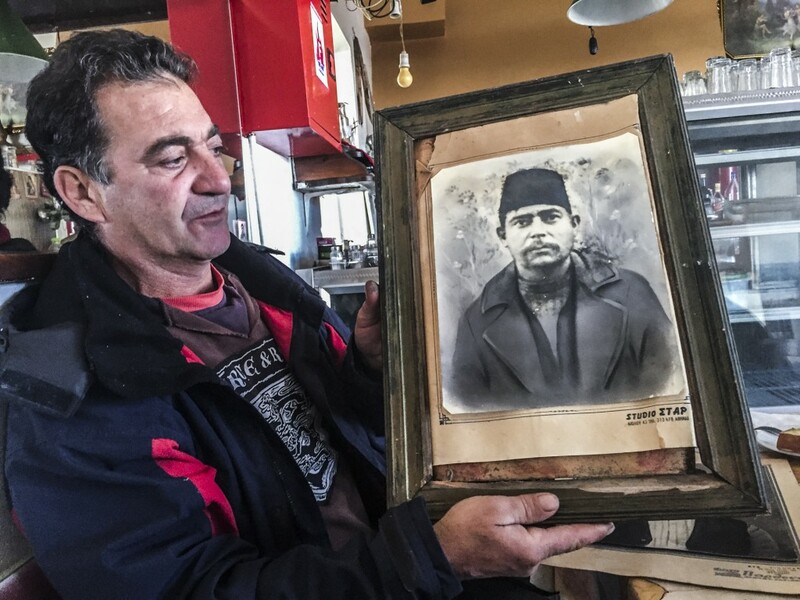 Mr Apostolos shows the photo his grand uncle who was recruited by Turkish army in Minor Asia. Yorgos Petrakis shares the same sentiment. I met Yorgos in the antique shop in front of the Yeni Cami (“New Mosque”) of Mr Themistoklis Firakis. 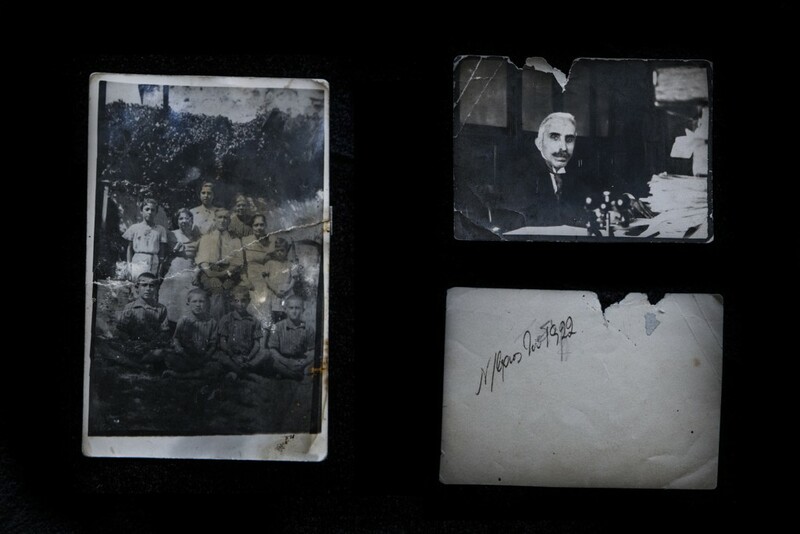 Petrakis and Firkinis helped me find photos of Asia Minor refugees which constitutes a collective memory binding the Asia Minor refugees in a community of shared experience. 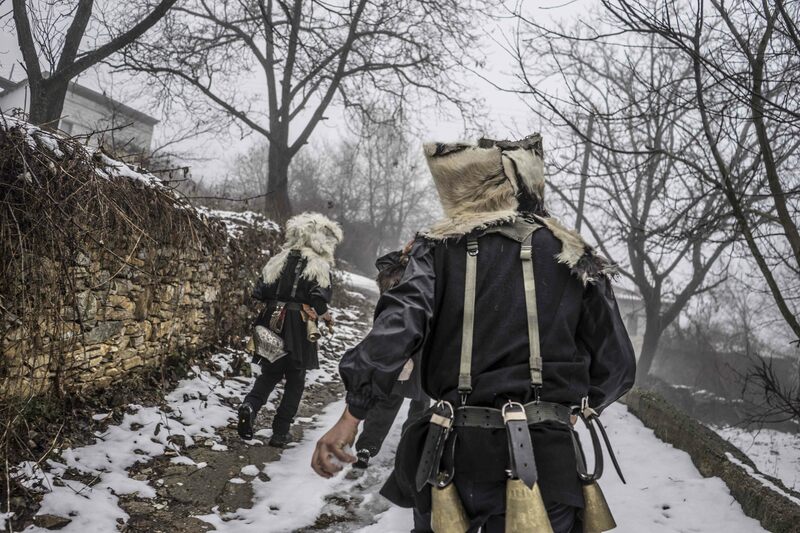 Memories of their lost homeland in Anatolia plays a major role in their attitude towards the current refugee crisis. Mr Yorgos Petrakis (left) and Mr Themistoklis Firkinis (right) who look at the old photo in his antique shop in front of Yeni Cami. Yorgos describes with tear in his eyes how a coffee saved his family life. When Greeks and Turks were living peacefully in Phocaea, a Turkish guard asked for a glass of water from Yorgos’ grandmother; she brought him a glass of water, Turkish coffee and offered him some sweets as a gesture of hospitality. Years later, when the Greeks were forced to leave Phocaea, the Turkish guard who was then part of the Ottoman army recognised Yorgos’ grandmother and helped them to sail safely out of Turkey. Yorgos sympathises with today’s refugees due his own past. “ During the summer, I used to take my motorbike and ride to a nearby village in order to see some friends and buy some fresh fruits from a friend of mine. On my way back I saw hundreds of refugees walking by the road under the hot sun. I had bought about 5 kilos of figs and 5 kilos of pears; I stopped the motor-bike and I gave one fruit to every single mother that passed. I was left with only 1 pear that I kept for my wife but I knew it was the right thing to do” he said proudly. 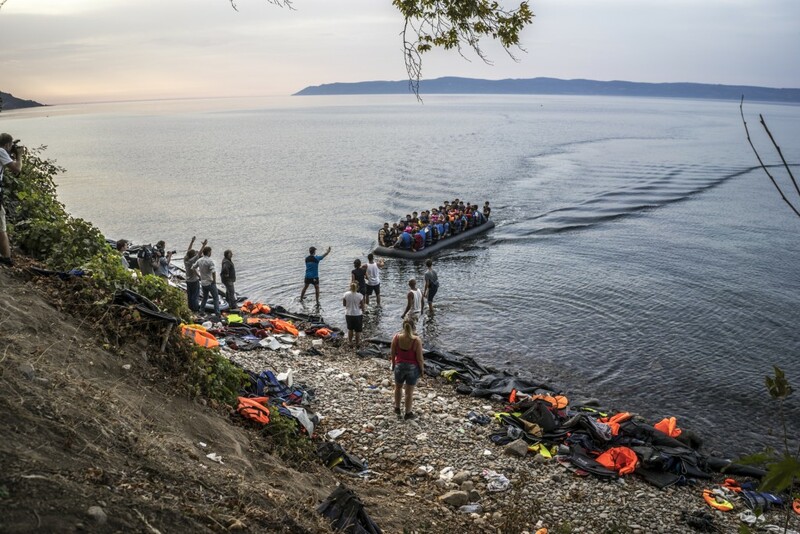 The loss that shaped the refugees identity is also a source of the empathy that today allows them to recognize the traumatic experience of Syrian, Afghan and Iraqi refugees on their island. An Anatolian Greek boy in Lesvos during the 1914 expulsion (left) and a Afghan boy in 2015 in Moria camp of Lesvos. Common meal distributed to Anatolian Greek refugees in Lesvos in 1914 (left) and an Afghan father with his daughter gets some food from the common meal in Moria Camp in Lesvos in 2015. Sitting at the faultlines between the East and the West, nations and empires, Lesvos occupies a special space which has shaped its peculiar identity. Evidence of Asian Minor’s uprooting is still visible on the island. 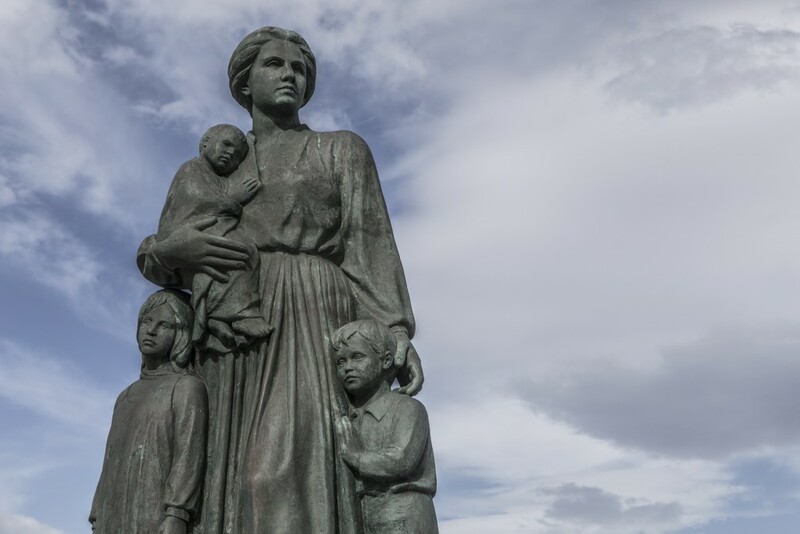 The statue of the Greek refugee mother stands proudly in front of the sea in the city of Mytilene. The statue of the refugee mother in Lesvos. A Syrian mother with her son just arrived in Lesvos, Greece. The Muslim motifs of the dilapidated mosques and crumbling minarets testify to the long Ottoman presence on the island. Four of these mosques still survive to this day. Many were converted to churches and have accommodated refugees in the past. Yeni Cami is the most impressive among the remaining ones. 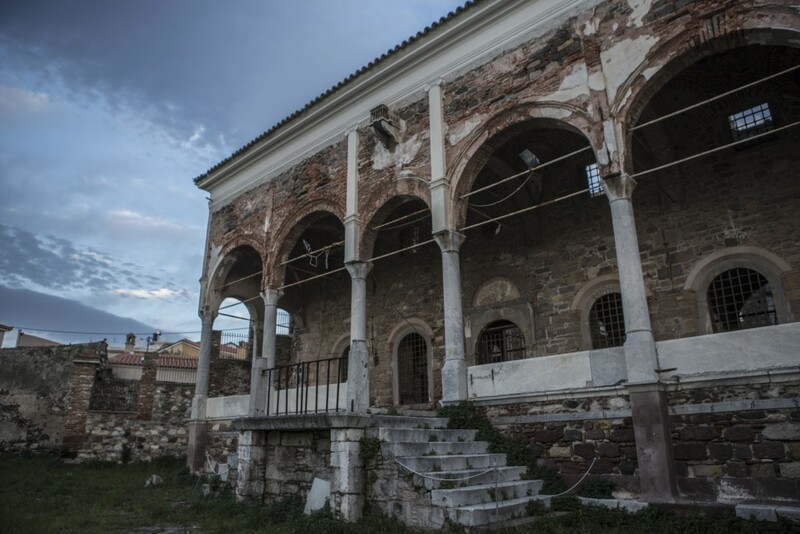 It’s located at the center of Mytilene and according to the small sign in the entrance, the mosque was built between 1824-1826. It accommodated many Greek refugees from 1922 until 1936. The Yeni Cami (“New Mosque”) in the city of Mytilene. 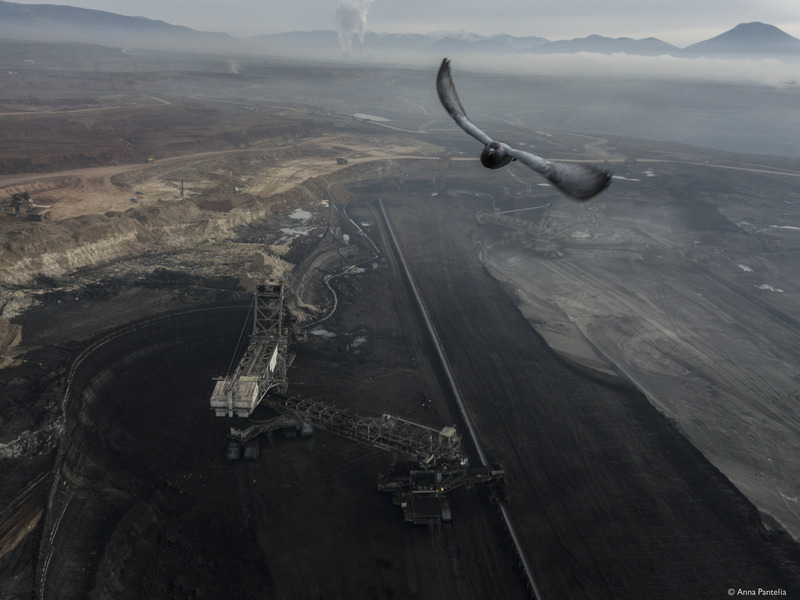 The 1922 catastrophe gradually transformed Greece. Ten years after the arrival of refugees the country’s arable land had increased by 55% and rural incomes had doubled. They also contributed to industrial development. Between 1923-1930, more than 900 industries were established. At the same time, foreign trade almost doubled. Apart from the industrial and agricultural development they also contributed to Greece’s culture and science. Scientists, intellectuals and artists helped enriched Greek heritage. 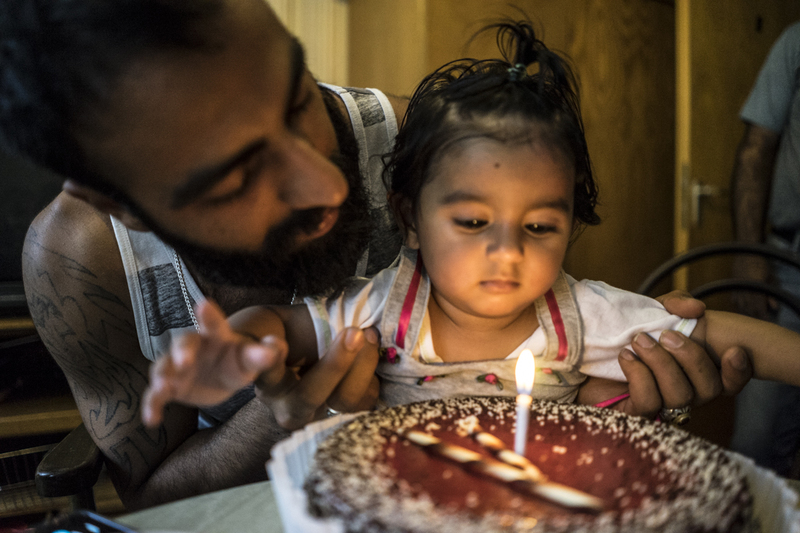 The trauma of displacement and the pain of exile is felt most acutely by refugees. The media prefers to focus on the strain on the host socities. But overlooked is the fact that people whose lives have been interrupted by tragedy are often more motivated than anyone else to resume their lives and to create a better future. In this determination, they always contribute more than they take. No one is more conscious of this than the uprooting from Asia Minor. That’s why when they see today’s refugees, they do not see a burden, rather they see a new world in its inception.